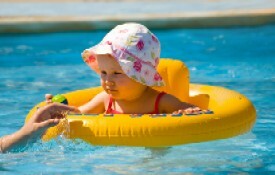 A baby sun hat is the perfect accessory to help protect your child from the sun's UV rays. A sun hat will keep their sensitive skin of the head and scalp from being burned. If a child experiences sunburn it can be very painful for them and it can easily cause skin damage because their skin is so sensitive. When it comes to choosing a baby sun hat for your child you want to keep a few things in mind. First of all, a regular baseball cap will not protect them in the same way that a sun hat would. 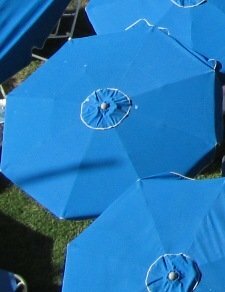 Sun hats typically have a wider brim on them which will protect their head, face and neck. Also, the rating on your child's hat should block at least 98% of the sun's rays. You really aren't going to get much better than that. A good sun hat will also provide an ultraviolet protection factor (UPF) of 50+ which is the maximum rating given for these hats. If your child is old enough you may want to let them help you choose a style that they like. Sometimes it can be hard getting a child to keep a hat on their heads so letting them pick might make them more excited to wear the hat - especially for longer periods of time. Children usually spend a lot of time outdoors, so a good hat can help with sun protection. Whether they're playing at the beach, attending a summer camp or making their daily trip to the playground they can get the UV protection they need to keep their skin healthy by wearing a proper sun hat. Sun hats can also be used during regular outside play or field trips that are taken with parents, school or daycare. If your child is spending time outside, it's a good idea to cover up their head with a sun hat. When it comes to hats that provide good sun protection the first thing you want to be sure of is that it has a wide brim. You generally want at least 3 to 4 inches to be sure it's providing enough protection. 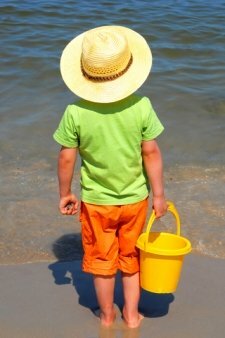 Straw hats are not going to protect your child much from UV rays. The rays of the sun can easily seep through the openings in those types of hats. To help reduce UV reflections you want the brim to have a dark color underneath which will help tremendously. It's also a good idea to choose a baby sun hat that is lightweight, made with breathable fabric and one that is also water resistant.